I have lots to love for the Audi's turbocharged four-cylinder engines and smooth-shifting transmissions. The A4 is one of the more fuel-efficient luxury small cars. You can seat five people inside an A4. Leather seats come standard and are reasonably comfortable for long stretches. For some, the cushions can feel a little firm on the standard seats, but the optional front sport seats remedy this and add side bolsters for extra comfort. For a small car, the rear seat is spacious, and there's enough room for two adults to easily climb in back and get cozy. Heated front seats are standard. A reliable, safe, awesome car that I love driving every day. My vehicle takes me to school and home everyday and provides a safe and reliable form of transport. I very rarely have problems with the car. It is good on gas so I am not constantly at the gas station draining my wallet. It offer a comfortable ride with the leather seats and awesome stereo system. I also use this car to go to the beach. The coolest cloud you'll ever float on. I have had a BMW 3 series and although that car has a great engine, I prefer Audi. Yes, I want speed, but I also want a smooth ride. It is so smooth that you can easily get to 100 mph before you realize you are way over the speed limit. I imagine would be a fun car to have if you live in Montana. 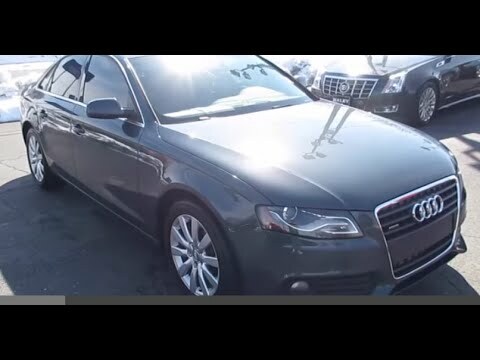 2010 Audi A4 Review. Not as Boring as other reviews!